Obstructive sleep apnea (OSA) is a common, widely underdiagnosed condition that is associated with significant morbidity and mortality. Due to intermittent anatomical blockage of the upper airway, reduction or cessation of airflow occurs during sleep, resulting in recurrent oxygen desaturation and sympathetic neural activation, with resultant nighttime hypertension and cortical arousal. This cycle results in sleep fragmentation and limits the amount of time spent in deeper sleep stages. Common symptoms include snoring, restless sleep, daytime fatigue, and morning headaches. If not treated, OSA is associated with an increased risk of cardiac, respiratory, and metabolic conditions, including hypertension, stroke, congestive heart failure, and sudden death. [1, 2, 3, 4, 5, 6, 7, 8, 9, 10, 11, 12, 13] The estimated prevalence of OSA with associated daytime sleepiness is 4% in adult men and 2% in adult women. Go to Obstructive Sleep Apnea for more complete information on this topic. Data generated from each test is analyzed in the same manner. Multiple studies have demonstrated excellent correlation between the results of multichannel HSTs and PSGs. The typical design of these studies pairs an individual HST against concurrent and/or serial PSGs. If a patient is unable to comply with the instructions for home sleep testing due to age or cognitive impairment, an attended sleep study is required. An attended study can be performed either in-facility or at home. Reported sensitivities for the HSTs range from 86-100%, while specificities range from 64-100%. The reported coefficient of correlation for AHI between 2 tests ranged from 0.74-0.98. Although these studies only validated the individual machine that was tested, the aggregate results of these studies indicated that HSTs, in general, provide an accurate and reproducible method of identifying patients with OSA. Of note, some studies found better agreement between PST and HST when the 2 tests were recorded simultaneously, as compared with separate recordings. Overall, patients have similar treatment outcomes whether OSA is diagnosed by PSG or HST. HSTs offer the advantage of allowing testing in the patient's own home and with less instrumentation, thereby theoretically providing a more natural sleeping environment. Additionally, HSTs are substantially less expensive and more widely available than in-facility PSGs. They can be used for the diagnosis of OSA and for home titration of positive airway pressure (PAP) treatment. No known risks are associated with home sleep tests (HSTs). Disadvantages of HSTs include the limited capability to immediately identify and resolve technical issues, the inability to diagnose other types of sleep disorders, and an increased role for the patient in terms of the application and use of the device, which may make some patients uncomfortable. In addition, the total sleep time cannot be calculated from an HST recording, since sleep and wake states are not directly assessed. As with PSG, improperly preparing the patient for HST or misplacement of the equipment may result in inconclusive results or inaccurate readings; however, with an HST, no attendant is present to solve these issues as they arise, so the patient may have to repeat the study. In patients in whom OSA is suspected based on history and/or physical examination findings, overnight recordings using HST monitors can be used to confirm the diagnosis of OSA. A sample patient intake form used at the Head and Neck Surgery Sleep Clinic at the University of California at San Diego is seen below. UCSD sleep-disordered breathing intake form. The routine addition of electroencephalogram (EEG) and electrooculogram (EOG) monitors in PSG allows recording of sleep stages and cortical arousals, which are typically unnecessary in the diagnosis of OSA but are critical in the diagnosis of other sleep disorders. Three categories of portable monitors (Type II, III, and IV) are used in the diagnosis of OSA in either an attended or unattended setting. Note that type III and IV portable monitors do not detect sleep stages. Instead, they extrapolate the respiratory disturbance index (RDI) or AHI based on the time period over which the recorder was switched on. Type II monitors have a minimum of 7 channels (eg, EEG, EOG, electromyogram, heart rate, airflow, respiratory effort, oxygen saturation). This type of device monitors sleep staging in addition to allowing calculation of AHI. Type III monitors are limited channel devices (usually 4-7 channels). They have a minimum of 4 monitored channels, including ventilation or airflow (at least 2 channels of respiratory movement or respiratory movement and airflow), heart rate, and oxygen saturation. HSTs have a variable number of channels for monitoring respiratory metrics, oxygen saturation, heart rate, chest and abdominal movement, leg movement, and snoring. Measurements of airflow typically use nasal prongs like those used to provide nasal oxygen. The sensor measures pressure changes. Alternatively, or in addition to the nasal sensor, an oral thermistor can be used to measure mouth breathing. This is useful for patients with complete nasal obstruction or significant nighttime nasal obstruction. For most HSTs, a pulse oximeter is attached to either the finger or earlobe for peripheral oxygen saturation monitoring. These sensors use the differential absorption of red and infrared light by oxygenated and deoxygenated hemoglobin to calculate the saturation of peripheral oxygen (SpO2). Although not as sensitive as the pulse oximetry monitors used in the operating room or the intensive care unit, these sensors provide data on the number and degree of oxygen desaturations during the night. 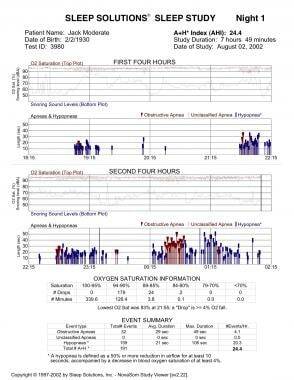 Often, this is reported as the number of oxygen desaturation events and the lowest oxygen saturation (LSAT). Heart rate can be monitored via a single-lead ECG, using an electrode attached to the upper chest. Chest and abdominal belts are used to measure respiratory effort and thereby differentiate between central and obstructive apneic events. Typically, bands with piezoelectric sensors or inductive plethysmography technology are used. A central apneic event is seen as the complete absence of movement of either belt. In contrast, an obstructive apneic event is measured as paradoxical movement during respiration, with abdominal expansion seen during inspiration without chest expansion. Leg movements can be recorded using a small cuff or belt placed around each ankle. These are generally not included with HSTs. Snoring can be measured by placing a microphone on the neck. Alternatively, it can be calculated from nasal pressure, since higher flow rates and greater force on vibrating structures produce lower-frequency pressure changes. Currently, neither of these methods has been validated as an objective means of measuring snoring. Patients should be able to sleep as they normally do, even if that includes turning over and sleeping on their abdomen. The electrodes and sensors should be attached in a manner that prevents them from coming off. HSTs are easy to administer. During the patient's clinic visit, show the patient how to apply the various recording devices and how these sensors are connected to the sleep machine (as demonstrated in the images below). Typical set-up for home sleep test. Image courtesy of Kristen Pickard, Embletta. Image of patient with HST in place. Image courtesy of Kristen Pickard, Embletta. Show the patient how the recording will be initiated when he or she goes to bed and how it will be stopped when the patient arises in the morning. Instruct the patient to return the machine to the clinician's office following the HST. At that time, the data are downloaded into a computer and analyzed either manually or automatically. Hypopneas are episodes of abnormally shallow breathing as defined by a 50-75% decrease in airflow. Some definitions require an oxygen desaturation of 2-4% or EEG arousal due to partial airway closure. Airway obstruction should last a minimum of 10 seconds in adults and 8 seconds in children (≥4 y). The apnea-hypopnea index (AHI) is the sum of the number of apneic and hypopneic episodes per hour of sleep. The respiratory disturbance index (RDI) is equal to the average number of respiratory disturbances per hour. It is similar to the AHI; however, it also includes respiratory events that do not technically meet the definitions of apneas or hypopneas but do disrupt sleep (as measured by cortical arousal) . Respiratory event–related arousals (RERAs) are events characterized by increasing respiratory effort for 10 seconds or longer, leading to an arousal from sleep; these events do not fulfill the criteria for a hypopnea or apnea. They can be measured with esophageal manometry. Thus, for adults, an AHI of 5 or more is typically considered abnormal. However, many insurance companies only cover treatment if the patient has an AHI of 15 or greater, or an AHI of 5-14 plus at least 2 OSA-related comorbidities. Medicare guidelines  designate a positive sleep study as an AHI or RDI greater than or equal to 15 events per hour. Alternatively, Medicare defines it as an AHI or RDI greater than or equal to 5 and less than or equal to 14 events per hour, with documented symptoms of excessive daytime sleepiness, impaired cognition, mood disorders or insomnia, or documented hypertension, ischemic heart disease, or history of stroke. No universally accepted criteria are available for oxygen desaturation or abnormal oxygen desaturation index in sleep-disordered breathing. In general, patients with multiple or more pronounced desaturations are viewed as having more severe OSA. Note, however, that the LSAT may be falsely lowered because of technical errors, such as displacement of the monitor. Conversely, the lack of oxygen desaturations does not rule out OSA. Apneas and hypopneas may occur without desaturations because of resolution of the event before desaturation occurs or due to lack of oximetry sensitivity. This is particularly true in children. Significant controversy surrounds the use of sleep tests in children. In the authors' experience, HSTs can be successfully used in children aged 4 years and older. However, certain modifications must be made to the application and interpretation of these tests when they are used in children. The child should be habituated to the nasal cannula by wearing it to bed for an entire week prior to the actual sleep test. Additionally, child-friendly gloves may be necessary to keep the child from pulling at the leads. Because children have a faster respiratory rate than adults, the criteria for apnea and hypopnea events need to be adjusted appropriately when scoring the sleep data. 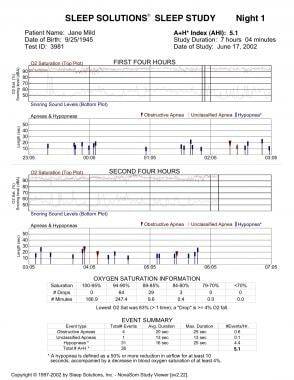 Sample sleep study results for mild, moderate, and severe OSA are shown in the images below. Sleep study: Mild obstructive sleep apnea (OSA). 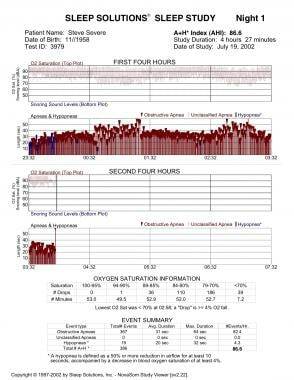 Oxygen saturation is demonstrated with the red tracing and snoring sound levels with the blue tracing. Each hypopneic episode is identified with a blue vertical line. Each apneic episode is identified with a red vertical line. The patient's total sleep time was 7 hours and 4 minutes. The lowest oxygen saturation was 83%. The patient's apnea index was 0.7 events per hour; the hypopnea index was 4.4 events per hour; and the apnea-hypopnea Index was 5.1 events per hour. The impression is mild OSA. Sleep study: Moderate obstructive sleep apnea (OSA). The patient's total sleep time was 7 hours and 49 minutes. The lowest oxygen saturation was 83%. The patient's apnea index was 4.1 events per hour; the hypopnea index was 20.3 events per hour; and the apnea-hypopnea index was 24.4 events per hour. All of the patient's apneic events are obstructive. Note the increasing number of both apneas and hypopneas in the latter half of the sleep study, which correlates with an increasing time spent in rapid eye movement (REM) sleep. Apneic and hypopneic episodes do not correlate well with snoring sound level. The impression is moderate OSA. Sleep study: Severe obstructive sleep apnea (OSA). The patient's total sleep time was 4 hours and 27 minutes. The lowest oxygen saturation was &lt; 70%. The patient's apnea index was 82.4 events per hour; the hypopnea index was 4.3 events per hour; and the apnea-hypopnea index was 86.6 events per hour. Note that the apneic events are all obstructive and that they are nearly continuous during the sleep study. The impression is severe OSA. Nieto FJ, Young TB, Lind BK, Shahar E, Samet JM, Redline S, et al. Association of sleep-disordered breathing, sleep apnea, and hypertension in a large community-based study. Sleep Heart Health Study. JAMA. 2000 Apr 12. 283(14):1829-36. [Medline]. Peppard PE, Young T, Palta M, Skatrud J. Prospective study of the association between sleep-disordered breathing and hypertension. N Engl J Med. 2000 May 11. 342(19):1378-84. [Medline]. Lavie P, Herer P, Hoffstein V. Obstructive sleep apnoea syndrome as a risk factor for hypertension: population study. BMJ. 2000 Feb 19. 320(7233):479-82. [Medline]. [Full Text]. Javaheri S, Parker TJ, Liming JD, Corbett WS, Nishiyama H, Wexler L, et al. Sleep apnea in 81 ambulatory male patients with stable heart failure. Types and their prevalences, consequences, and presentations. Circulation. 1998 Jun 2. 97(21):2154-9. [Medline]. Trupp RJ, Hardesty P, Osborne J, Shelby S, Lamba S, Ali V, et al. Prevalence of sleep disordered breathing in a heart failure program. Congest Heart Fail. 2004 Sep-Oct. 10(5):217-20. [Medline]. Sin DD, Fitzgerald F, Parker JD, Newton G, Floras JS, Bradley TD. Risk factors for central and obstructive sleep apnea in 450 men and women with congestive heart failure. Am J Respir Crit Care Med. 1999 Oct. 160(4):1101-6. [Medline]. Laaban JP, Pascal-Sebaoun S, Bloch E, Orvoën-Frija E, Oppert JM, Huchon G. Left ventricular systolic dysfunction in patients with obstructive sleep apnea syndrome. Chest. 2002 Oct. 122(4):1133-8. [Medline]. Dyken ME, Somers VK, Yamada T, Ren ZY, Zimmerman MB. Investigating the relationship between stroke and obstructive sleep apnea. Stroke. 1996 Mar. 27(3):401-7. [Medline]. Good DC, Henkle JQ, Gelber D, Welsh J, Verhulst S. Sleep-disordered breathing and poor functional outcome after stroke. Stroke. 1996 Feb. 27(2):252-9. [Medline]. Parra O, Arboix A, Bechich S, García-Eroles L, Montserrat JM, López JA, et al. Time course of sleep-related breathing disorders in first-ever stroke or transient ischemic attack. Am J Respir Crit Care Med. 2000 Feb. 161(2 Pt 1):375-80. [Medline]. Vgontzas AN, Bixler EO, Chrousos GP. Sleep apnea is a manifestation of the metabolic syndrome. Sleep Med Rev. 2005 Jun. 9(3):211-24. [Medline]. Gami AS, Howard DE, Olson EJ, Somers VK. Day-night pattern of sudden death in obstructive sleep apnea. N Engl J Med. 2005 Mar 24. 352(12):1206-14. [Medline]. Stergiou GS, Triantafyllidou E, Cholidou K, Kollias A, Destounis A, Nasothimiou EG, et al. Asleep home blood pressure monitoring in obstructive sleep apnea: a pilot study. Blood Press Monit. 2013 Feb. 18(1):21-6. [Medline]. Young T, Palta M, Dempsey J, Skatrud J, Weber S, Badr S. The occurrence of sleep-disordered breathing among middle-aged adults. N Engl J Med. 1993 Apr 29. 328(17):1230-5. [Medline]. Antic NA, Buchan C, Esterman A, Hensley M, Naughton MT, Rowland S, et al. A randomized controlled trial of nurse-led care for symptomatic moderate-severe obstructive sleep apnea. Am J Respir Crit Care Med. 2009 Mar 15. 179(6):501-8. [Medline]. Ramachandran SK, Josephs LA. A meta-analysis of clinical screening tests for obstructive sleep apnea. Anesthesiology. 2009 Apr. 110(4):928-39. [Medline]. Ballester E, Solans M, Vila X, Hernandez L, Quintó L, Bolivar I, et al. Evaluation of a portable respiratory recording device for detecting apnoeas and hypopnoeas in subjects from a general population. Eur Respir J. 2000 Jul. 16(1):123-7. [Medline]. Redline S, Tosteson T, Boucher MA, Millman RP. Measurement of sleep-related breathing disturbances in epidemiologic studies. Assessment of the validity and reproducibility of a portable monitoring device. Chest. 1991 Nov. 100(5):1281-6. [Medline]. Whittle AT, Finch SP, Mortimore IL, MacKay TW, Douglas NJ. Use of home sleep studies for diagnosis of the sleep apnoea/hypopnoea syndrome. Thorax. 1997 Dec. 52(12):1068-73. [Medline]. [Full Text]. Jiménez Gómez A, Golpe Gómez R, Carpizo Alfayate R, de la Roza Fernández C, Fernández Rozas S, García Pérez MM. [The validation of a portable 3-channel recording system (Oxyflow, Edentec) for the diagnosis of the sleep apnea syndrome]. Arch Bronconeumol. 2000 Jan. 36(1):7-12. [Medline]. Man GC, Kang BV. Validation of a portable sleep apnea monitoring device. Chest. 1995 Aug. 108(2):388-93. [Medline]. Bradley PA, Mortimore IL, Douglas NJ. Comparison of polysomnography with ResCare Autoset in the diagnosis of the sleep apnoea/hypopnoea syndrome. Thorax. 1995 Nov. 50(11):1201-3. [Medline]. [Full Text]. Fleury B, Rakotonanahary D, Hausser-Hauw C, Lebeau B, Guilleminault C. A laboratory validation study of the diagnostic mode of the Autoset system for sleep-related respiratory disorders. Sleep. 1996 Jul. 19(6):502-5. [Medline]. Kiely JL, Delahunty C, Matthews S, McNicholas WT. Comparison of a limited computerized diagnostic system (ResCare Autoset) with polysomnography in the diagnosis of obstructive sleep apnoea syndrome. Eur Respir J. 1996 Nov. 9(11):2360-4. [Medline]. Gugger M. Comparison of ResMed AutoSet (version 3.03) with polysomnography in the diagnosis of the sleep apnoea/hypopnoea syndrome. Eur Respir J. 1997 Mar. 10(3):587-91. [Medline]. Mayer P, Meurice JC, Philip-Joet F, Cornette A, Rakotonanahary D, Meslier N, et al. Simultaneous laboratory-based comparison of ResMed Autoset with polysomnography in the diagnosis of sleep apnoea/hypopnoea syndrome. Eur Respir J. 1998 Oct. 12(4):770-5. [Medline]. Dingli K, Coleman EL, Vennelle M, Finch SP, Wraith PK, Mackay TW, et al. Evaluation of a portable device for diagnosing the sleep apnoea/hypopnoea syndrome. Eur Respir J. 2003 Feb. 21(2):253-9. [Medline]. Claman D, Murr A, Trotter K. Clinical validation of the Bedbugg in detection of obstructive sleep apnea. Otolaryngol Head Neck Surg. 2001 Sep. 125(3):227-30. [Medline]. Reichert JA, Bloch DA, Cundiff E, Votteri BA. Comparison of the NovaSom QSG, a new sleep apnea home-diagnostic system, and polysomnography. Sleep Med. 2003 May. 4(3):213-8. [Medline]. Bar A, Pillar G, Dvir I, Sheffy J, Schnall RP, Lavie P. Evaluation of a portable device based on peripheral arterial tone for unattended home sleep studies. Chest. 2003 Mar. 123(3):695-703. [Medline]. Pittman SD, Ayas NT, MacDonald MM, Malhotra A, Fogel RB, White DP. Using a wrist-worn device based on peripheral arterial tonometry to diagnose obstructive sleep apnea: in-laboratory and ambulatory validation. Sleep. 2004 Aug 1. 27(5):923-33. [Medline]. Ayas NT, Pittman S, MacDonald M, White DP. Assessment of a wrist-worn device in the detection of obstructive sleep apnea. Sleep Med. 2003 Sep. 4(5):435-42. [Medline]. Zou D, Grote L, Peker Y, Lindblad U, Hedner J. Validation a portable monitoring device for sleep apnea diagnosis in a population based cohort using synchronized home polysomnography. Sleep. 2006 Mar 1. 29(3):367-74. [Medline]. Su S, Baroody FM, Kohrman M, Suskind D. A comparison of polysomnography and a portable home sleep study in the diagnosis of obstructive sleep apnea syndrome. Otolaryngol Head Neck Surg. 2004 Dec. 131(6):844-50. [Medline]. Wang Y, Teschler T, Weinreich G, Hess S, Wessendorf TE, Teschler H. [Validation of microMESAM as screening device for sleep disordered breathing]. Pneumologie. 2003 Dec. 57(12):734-40. [Medline]. Chen H, Lowe AA, Bai Y, Hamilton P, Fleetham JA, Almeida FR. 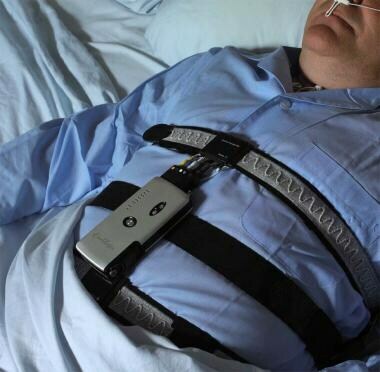 Evaluation of a portable recording device (ApneaLink) for case selection of obstructive sleep apnea. Sleep Breath. 2009 Aug. 13(3):213-9. [Medline]. Tonelli de Oliveira AC, Martinez D, Vasconcelos LF, Gonçalves SC, Lenz MC, Fuchs SC, et al. Diagnosis of obstructive sleep apnea syndrome and its outcomes with home portable monitoring. Chest. 2009 Feb. 135(2):330-6. [Medline]. Santos-Silva R, Sartori DE, Truksinas V, Truksinas E, Alonso FF, Tufik S, et al. Validation of a portable monitoring system for the diagnosis of obstructive sleep apnea syndrome. Sleep. 2009 May 1. 32(5):629-36. [Medline]. [Full Text]. Yagi H, Nakata S, Tsuge H, Yasuma F, Noda A, Morinaga M, et al. Significance of a screening device (Apnomonitor 5) for sleep apnea syndrome. Auris Nasus Larynx. 2009 Apr. 36(2):176-80. [Medline]. Ayappa I, Norman RG, Seelall V, Rapoport DM. Validation of a self-applied unattended monitor for sleep disordered breathing. J Clin Sleep Med. 2008 Feb 15. 4(1):26-37. [Medline]. [Full Text]. Ghegan MD, Angelos PC, Stonebraker AC, Gillespie MB. Laboratory versus portable sleep studies: a meta-analysis. Laryngoscope. 2006 Jun. 116(6):859-64. [Medline]. Collop NA, Anderson WM, Boehlecke B, Claman D, Goldberg R, Gottlieb DJ, et al. Clinical guidelines for the use of unattended portable monitors in the diagnosis of obstructive sleep apnea in adult patients. Portable Monitoring Task Force of the American Academy of Sleep Medicine. J Clin Sleep Med. 2007 Dec 15. 3(7):737-47. [Medline]. [Full Text]. Bruyneel M, Van den Broecke S, Libert W, Ninane V. Real-time attended home-polysomnography with telematic data transmission. Int J Med Inform. 2013 Mar 23. [Medline]. Phurrough S, Jacques L, Spencer F, Stiller J, Brechner R. Decision Memo for Continuous Positive Airway Pressure (CPAP) Therapy For Obstructive Sleep Apnea (OSA). Centers for Medicare & Medicaid. 3/13/2008. 1-35. [Full Text]. Ayappa I, Norman RG, Suryadevara M, Rapoport DM. 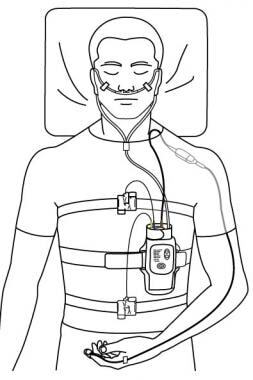 Comparison of limited monitoring using a nasal-cannula flow signal to full polysomnography in sleep-disordered breathing. Sleep. 2004 Sep 15. 27(6):1171-9. [Medline]. Nuber R, Vavrina J, Karrer W. [Predictive value of nocturnal pulse oximetry in sleep apnea screening]. Schweiz Med Wochenschr Suppl. 2000. 116:120S-122S. [Medline]. Sériès F, Kimoff RJ, Morrison D, Leblanc MH, Smilovitch M, Howlett J, et al. Prospective evaluation of nocturnal oximetry for detection of sleep-related breathing disturbances in patients with chronic heart failure. Chest. 2005 May. 127(5):1507-14. [Medline]. Sériès F, Marc I, Cormier Y, La Forge J. Utility of nocturnal home oximetry for case finding in patients with suspected sleep apnea hypopnea syndrome. Ann Intern Med. 1993 Sep 15. 119(6):449-53. [Medline]. Gyulay S, Olson LG, Hensley MJ, King MT, Allen KM, Saunders NA. A comparison of clinical assessment and home oximetry in the diagnosis of obstructive sleep apnea. Am Rev Respir Dis. 1993 Jan. 147(1):50-3. [Medline]. Hamada M, Iida M. Home monitoring using portable polygraphy for perioperative assessment of pediatric obstructive sleep apnea syndrome. Tokai J Exp Clin Med. 2012 Sep 20. 37(3):66-70. [Medline]. Pavone M, Cutrera R, Verrillo E, Salerno T, Soldini S, Brouillette RT. Night-to-night consistency of at-home nocturnal pulse oximetry testing for obstructive sleep apnea in children. Pediatr Pulmonol. 2013 Mar 26. [Medline]. Dernaika T, Tawk M, Nazir S, Younis W, Kinasewitz GT. The significance and outcome of continuous positive airway pressure-related central sleep apnea during split-night sleep studies. Chest. 2007 Jul. 132(1):81-7. [Medline]. Disclosure: Received honoraria from ResMed Foundation Board for assist the board in awarding scientific and other grants; Received none from ImThera for medical advisor for a sleep apnea company.